As Director of Organization and Education of the National Farmers Union, Fred helped make history in Canada. He organized the resistance of rural communities in confronting the state and corporate power structures: the 1970 rally in Regina of 10,000 farmers and their urban allies was a decisive force in the defeat of the Ross Thatcher government; the national tractor demonstrations of 1969-1971 from Prince Edward Island to the Peace River country demanding collective bargaining rights for farmers; and the Kraft boycott to help preserve small rural cheese factories and dairy farmers. Fred was the master strategist in all these events and many others - planning to the last detail, being inventive, creative, irreverent, humorous and militant in what was done. Fred worked with the Schreyer government in Manitoba on agricultural development in northern Aboriginal communities and in fostering local participation in economic development planning and implementation, which he thought essential if Aboriginal people were ever to control their own destiny. His memos castigating community development officers for their paternalism and for effectively restraining peoples' demands on government are classics in the theory and practice of community development. Later he worked independently with First Nations communities in Manitoba, the Northwest Territories and north-western Ontario. He worked with the God's River Band in Manitoba in helping them improve their housing, taking over the airstrip and the fishing lodge. He fervently believed that unless self-government was built on a sound economic basis, it would have little impact on the lives of Aboriginal people. He carried this principle into his work with Grand Chief Georges Erasmus and the Dene Nation where they negotiated the historic Norman Wells joint agreement. Fred was a prolific writer. He wrote for Canadian Dimension, Briarpatch, and until recently, had a column in the Prince George Citizen. His column in Canadian Dimension was essential reading and the range of subjects he covered was staggering. He had an acerbic, and often hilarious writing style filled with satire. Some of his Dimension pieces remain classics to this day. For example, his expose of the exploitation of women workers by a Winnipegbased clothing company was a thorough piece of original, investigative journalism which still has resonance and unfortunately, relevance today. 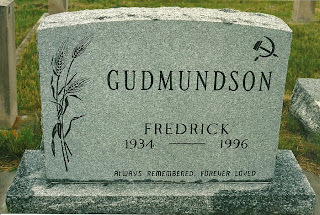 Fred was an internationalist and local activist. He supported the anti-apartheid movement for a free South Africa. He was arrested for supporting the CAIMAW Griffin workers against compulsory overtime in the mid-1970s. Fred was committed to First Nations solidarity including the fight against Reed Paper's pollution of the Winnipeg River that caused mercury poisoning in Indian communities. Fred and his partner Carol Sigurdson, from whom he drew great strength, opened their home and their hearts to many people. One rarely left their company without learning something new about this great country. 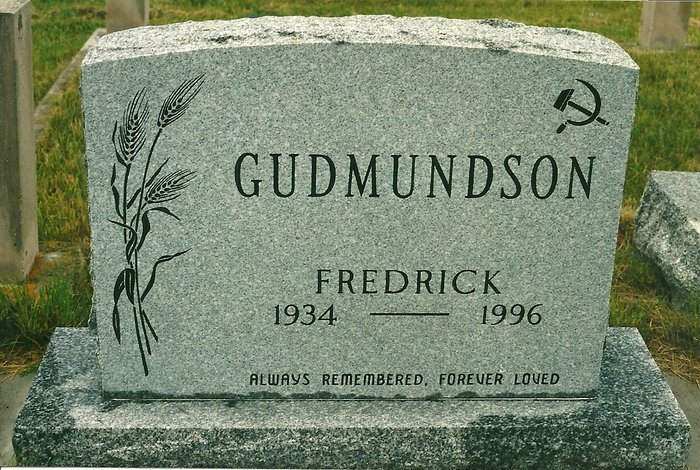 For Fred was a wonderful teacher with a deep love and encyclopedic knowledge of Canada, the land, its people, the struggles of workers and small farmers. He could cut through trivia to highlight the essence of any issue and his teaching drew on his own practical experience, activism and commitment to socialist ideals. Although he was a life-long member of the NDP, Fred had a love-hate relationship with the party, all too frequently being disappointed in its timidity and acceptance of the status quo. He and Carol were active in the Waffle and other attempts to move the party to the left. Fred was a joy to work and be with. He was down-to-earth, stimulating and provocative, never dull. He was generous in the friendship he shared with others. He had a special empathy for young people, taking the time to listen, respecting their opinions and keeping in touch with them as they journeyed through life. But how can we do justice to Fred without mentioning his uproarious sense of humour and mischievousness? - this was ever present in everything that he did. With friends it was always gentle fun and getting us to laugh at ourselves. Fred saved his vitriolic satire for the captains of industry and finance, corrupt politicians and the like. As his Regina friends said in a message to Fred's family, "his incredible audacity saved the day at many a protest demonstration, and his warmth, humour and humanity helped to maintain the morale of social movements in the midst of the most desperate struggles. Just knowing that Fred was there and that he was solid as a rock in support of others made the struggle more bearable." He had an amazing rapport with and concern for how the ordinary Canadian was faring. Fred wrote his Prince George Citizen column from conversations shared on coffee row. As Milton Braaten in Prince George said, "he was forthright, honest, down to the nitty-gritty, he called a spade a spade whether it was an NDP spade or a Socred spade, and he didn't pull any punches with anybody." Fred was a great thinker, writer, and socialist. Above all, he was a practical person and a doer with a deep commitment to improving the world. We grieve at his passing. Canada has lost a remarkable man.